The safest hiking route from Glenridding is out Greenside Road and over the 2,896ft Raise and 2,831ft White Side mountains. The slightly dangerous route from Glenridding and Patterdale is over the 2,355ft Birkhouse Moor, then along the knife edge ridge of Striding Edge. Hiking up from Patterdale takes you over Striding Edge. Patterdale car parks are pay and display, Glenridding is free. The image below is of Glenridding centre. There is a lot of free parking in the centre of Glenridding. Patterdale is less than one mile straight down the road in the image below. The large green sign there is pointing to Greenside Road and the Travellers Rest, that road is the most popular route to Helvellyn, as it gives you the option of both routes further up. 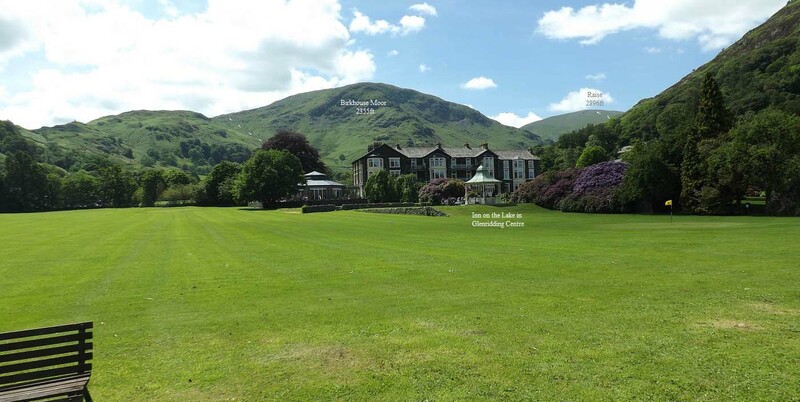 The image below is from the golf course at the Inn on The Lake in the centre of Glenridding. The inn has a popular bar diner for hikers. This spot gives a good view out to Helvellyn, that is straight out behind Birkhouse Moor. The white lines show the two routes. You do not need to go over the top of Birkhouse Moor to get to Striding Edge, as there is a trail around it. Large Image . The image below is of Greenside Road as it passes the Travellers Rest, a good spot for a pub, as there is a lot of passing trade. The image below is from Greenside Road, a few hundred yards past the Travelers Rest . That is the trail leading out to Birkhouse Moor, Striding Edge and Helvellyn. Only take that route if you have a head for heights, and like a little danger. The image below is from Greenside Road as it heads out to an old mine, and the trail onto Raise and White Side. White Side and Helvellyn are over to the left of Raise. This is said to be the safest and steadiest way to the top of Helvellyn. The image below is by Alan Waters from his hike to Helvellyn from Glenridding via the Raise and White Side route. This image is from Helvellyn looking down to Striding Edge, Red Tarn water, and Ullswater lake in the distance, behind Birkhouse Moor. Stridding Edge has a path over the top, and a path just down from the top most of the way, both require a head for heights. 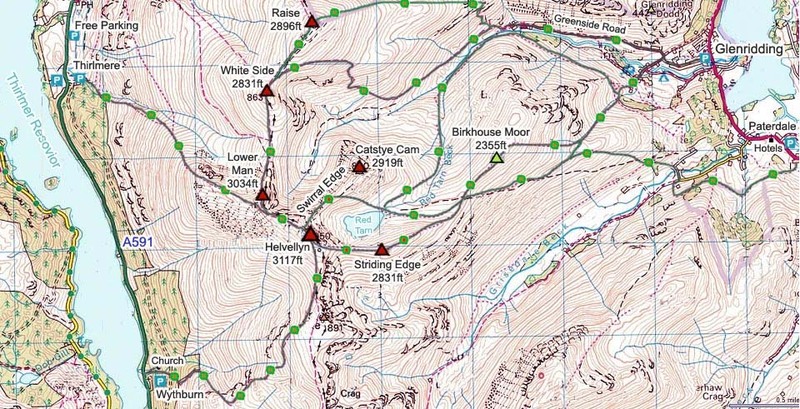 The Helvellyn Map below shows many of the routes to this mountain. Helvellyn is a top mountain with a number of great routes to suit most hikers. Helvellyn Photo Tour from Thrlmere.